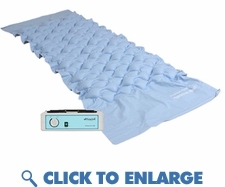 This deluxe alternating pressure pad is adjustable and supports up to 300 lbs. It is designed for pressure relief, therapy, and the treatment of pressure sores. You can easily adjust the pad from firm to soft for maximum patient comfort. The deluxe pad has end flaps that tuck under to help secure it in place. This adjustable alternating pad system fits nicely over a standard medical bed frame or twin sized home mattress. It is light weight and easy to transport. The alternating pressure pad can be easily replaced. The design of the bubble pad allows for greater skin contact and better overall therapy. Add an extra pad at at 15.00 discount with purchase of a new adjustable pad system. Adjustable pump enables clinician to control interface pressure by adjusting air flow.